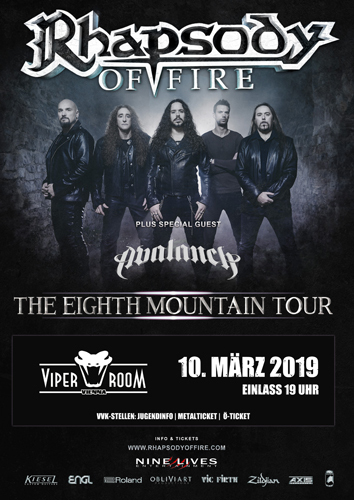 The world-renowned symphonic metal band Rhapsody Of Fire will be performing in more than 17 cities all around Europe with Special Guests to be announced. Ticket Pre-Order will be available from Friday, November 16th – be ready! Are you ready to conquer the Eighth Mountain? to songs from their highly-anticipated next release. Avalanch rund um Mike Terrana (ex-Axel Rudi Pell, ex-Rage, ex-Tarja) und Dirk Schlächter (Gamma Ray) werden Rhapsody Of Fire tatkräftig als Support unterstützen!